Putting This Month's Severe Weather Outbreak In Historical Perspective : The Two-Way This month will almost certainly become the April with most tornadoes on record. And could possibly become the month with the most tornadoes on record period. 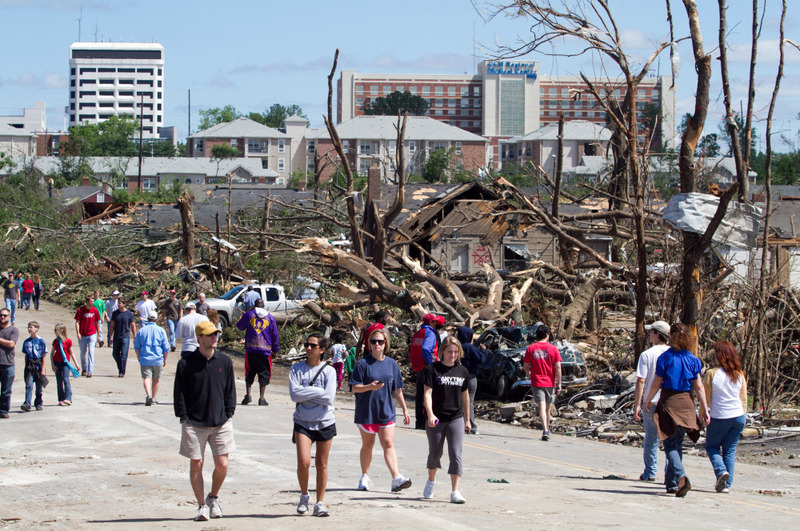 In the aftermath of a severe tornado, residents wander the steets near downtown Tuscaloosa surveying the damage. TWC Severe Weather Expert Dr. Greg Forbes says April has set a record, with a preliminary count of 453 tornadoes during the month (not yet counting the April 27 tornado outbreak totals), breaking the old mark of 267 tornadoes in 1974. Keep in mind, an average entire month of April sees "only" 163 tornadoes. As Mark reported earlier, the National Weather Service has so far recorded 164 tornadoes, during yesterday's storms. So that 2003 record is certainly in jeopardy. And when you thought, "Didn't we just have another 'historical' outbreak of weather just a few weeks ago?" you were right. Both yesterday's outbreak and the April 14-16 outbreak were historic. As the Washington Post's Capital Weather Gang puts it yesterday's outbreak of 164 tornadoes is the third deadliest since the 1930s. The April 14-16 outbreak spawned 289 tornadoes across 15 states. As Accuweather's Henry Margusity puts it: "There has not been a tornado outbreak in history over three days with this many tornadoes spawned by a single storm system." The Capital Weather Gang compares yesterday's tornadoes to one termed the Super Outbreak of 1974, which spawned the Xenia, Ohio F5, which was just as massive and deadly as the one that hit Tuscaloosa, yesterday. This historical picture from Xenia looks eerily like images Mark has posted of the Tuscaloosa twister. A large part of the answer lies in the airflow in the upper portion of the atmosphere, at the jet stream level. There has been a parade of energetic storm systems, accompanied by very strong jet stream winds, diving down into the southern states this spring. These dips, or "troughs", in the jet have helped set up major clashes between cold air to the north and warm, humid air from the Gulf of Mexico to the south.